From left to right: Anne Bertrand, New Brunswick Foundation for the Arts Chair, Dawn Arnold, Frye Festival Chair, and Theresa McArthur, TD Canada Trust representative. The Frye Festival was named “TD Canada Trust Arts Organization of the Year” by the New Brunswick Foundation for the Arts. The Foundation recognized the Festival’s admirable work with young audiences in the area of the literary arts and awarded Canada’s only bilingual international literary festival $3,000. 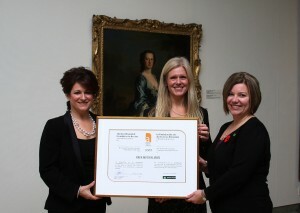 The award ceremony was held Friday, November 6, 2009 at the Beaverbrook Art Gallery in Fredericton. The Frye Festival’s Youth Program impacts more than 11,000 students every year. Students from elementary to high school interact with authors in their schools and are inspired in increasing numbers to present their own works during the Festival. In 2009, the Festival organized more than 140 school visits in four school districts in the province, donated $8,000 in new books to schools, and awarded $4,500 in prize money to winners of its writing contest and to schools. “The Frye Festival is thrilled to receive this award on behalf of all of the members of our community who have contributed so much to the Festival’s success over the last ten years. Thank you to all the board members, volunteers, sponsors, and staff who have worked so tirelessly to create a Festival that is worthy of such a great prize,” says Dawn Arnold, Festival Chair. A jury formed of arts professionals met in August to evaluate the candidates nominated for the 2009 NB Foundation for the arts prizes. The Frye Festival marked its tenth anniversary in 2009 with a 10-day edition spanning from April 17th to the 26th. Many renowned authors took part including Jane Urquhart, Wayne Johnston, Miriam Toews, Antonine Maillet, and Alexandre Jardin.